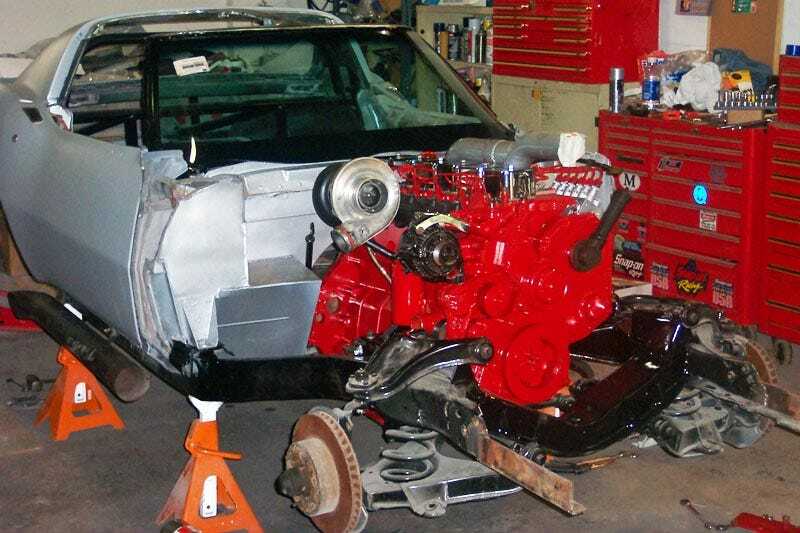 It's beautiful sacrilege, putting a built Cummins 12V turbodiesel into a 1968 Corvette. Ryan Lusk of Iowa-based Low Budget Diesel Performance has done just that, and he's decided to take the car drag racing. Ryan is a great American hero. Of all the places we hear about crazy contraptions, our absolute favorite and unquestionably least likely source is a subscription-only newspaper-style printed publication called Farm Show. It's a fantastic collection of the most clever, ridiculous, scary and cool creations to come out of farmer's garages. We picked up a copy back home on the farm while recovering from taking down unnatural amounts of turkey and stuffing and all the Thanksgiving trimmings, and guess what we found. Amidst the loader scoops made from cut-in-half LP tanks, home brew automatic silage choppers, and articulated tractors made out of two junked Chevy pickups welded together, a 1968 Corvette powered by a 12 valve Cummins. The post-meal nap was immediately postponed. Moser 35 Spline Axles, 35 spline Moser spool, Moser HRW Nodular case, Daytona Pinion Support, Pro Gear 3.25 gears, Billet Yoke, 1410/1350 Severe Duty U-joints, Heavy Duty 30 spline output yoke, Art Morrison Coil Over Shocks, 4-Link Suspension, Corvette 4 Piston Disc Brakes, Wheelie Bars. 1998 12V CTD Bored .030 over, Mahle Pistons, Balanced and Blue Printed, Viscous dampener, 60lb valve springs, ARP Head Studs, 64/65 S300 Turbo, LBDP Exhaust manifold, 215HP cam, 180HP P7100 480cc's with .022 DV's and 550 with Full Cut DV's, 4k gsk, Mack Rack Plug, AFC mods, multiple fuel plates, Custom Revolution Diesel 370 Marine Injectors, IP Tuned by Smokem at Revolution Diesel in Hornick, Ia. IP assembled by Des Moines Diesel in Des moines, Ia. Aluminum Radiator, Huge Trans cooler, electric fans with electronic thermo coupling control. 1968 corvette with 1973 rear quarter panels, 1972 Front clip converted to one piece tilt by LBDP. 12pt roll cage, with door swing outs, summit racing seats with 5pt. harness, aluminum floors, firewall, trans tunnel, wheel tubs, dash, and door panels. Auto meter gauges, aftermarket wiring harness, S&W Race Cars steering column with quick connect hub. 16 gallon TCI Fuel Cell, Air Dog 150 feeding a Raptor 150 Provided by Pure Flow Technologies. We think it safe to say this is the best possible thing you could ever do with a previously-crashed plastic fantastic. There's so much awesome piled into this car it's practically incomprehensible. Actually, hold that thought, you haven't seen the car running. Check out the three videos below. We're going to parrot the words of the drag racing announcer.... "Oh my GOD!?" If we may humbly make one suggestion to Mr. Lusk, we think it needs a constant stream of the Nuge piped to exterior speakers to properly serenade that majestic turbodiesel note. Nothing else so uncontrollable and unpredictably violent could possibly do the job.